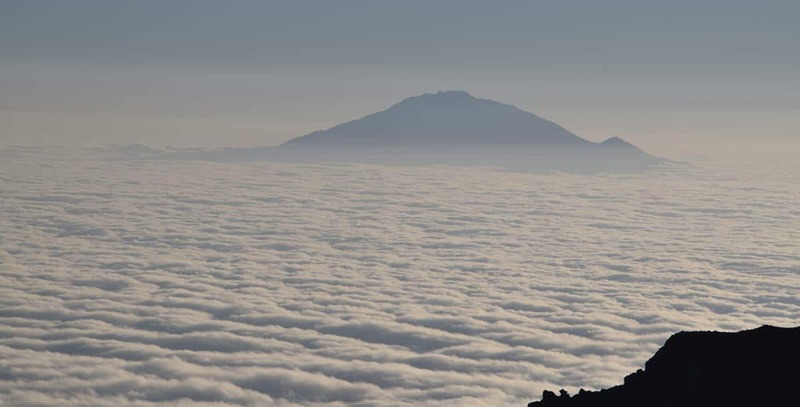 The second highest mountain in Tanzania, Mt Meru at 4566m, like her sister Mt Kilimanjaro is classified as a dormant volcano. It is located inside of Arusha National Park, a short drive from either Moshi or Arusha City. The climb typically is done on a 4 day itinerary but can also be managed in three days. The extra day is spent on the descent, so it does not aid in altitude adjustment but makes the climb more comfortable. It is a steeper climb than Mt Kilimanjaro, which makes it actually easier to adjust to the altitude. People often use the trek to acclimate for a Mt Kilimanjaro attempt but it is a great climb in its own right. There is only one route on the mountain. Overnights are spent inside of simple huts. As there is a possibility of encountering animals on the first part of the trek, an armed park ranger is required by park regulations to accompany all trekkers. The packing list for this trek is identical to that of Mt Kilimanjaro. The trek follows the trails, often well-used game routes, through the forest towards the crater floor, and then climbs steeply up to Miriakamba Hut. Buffalo may be seen just after Momella gate on the wide, open plain. Further on there is an impressive Fig Tree Arch, streams and waterfalls. Overnight at Miriakamba Hut. Trek continues up to Elephant Ridge where lunch is taken and there are spectacular views down into the crater and up to the main cliffs below the summit. From Saddle Hut the peak of Little Meru can reached in approximately an hour and offers impressive and imposing views of the summit and the sheer cliffs of the crater’s inner walls. Overnight at Saddle Hut. Depart Saddle Hut around midnight to reach the summit for sunrise over Kilimanjaro. This exhilarating trek follows the narrow ridge between the sloping outer wall of the crater and the sheer cliffs of the inner wall. Descend to Miriakamba Hut for overnight. (Possible excursion to Rhino Point at guide and groups discretion). A short and leisurely trek winds down to the crater floor and then on to Momella gate where your transport will be waiting to take you back to your hotel. Note: This trek can be done as a three day itinerary. Day three would have a rest at Miriakamba Hut then continuing all the way to the main gate.